Isoprene is a common name for the chemical compound 2-methylbuta-1,3-diene. At room temperature, purified isoprene is a highly flammable, colorless liquid that can be easily ignited. It is formed naturally in animals and plants and is the most common hydrocarbon in the human body. Natural rubber is a polymer of isoprene—most often cis-1,4-polyisoprene—with a molecular weight ranging from 100,000 to 1,000,000 daltons. Typically, high-quality natural rubber also contains a few percent of other materials, such as proteins, fatty acids, resins, and inorganic materials. Some natural rubber sources (called gutta percha) are composed of trans-1,4-polyisoprene, a structural isomer of the cis form, with similar but not identical properties. Isoprene is also an important industrial chemical, being readily available as a by-product of the thermal cracking of naphtha or oil. 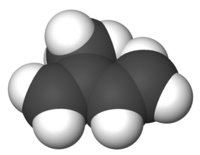 About 95 percent of isoprene production is used to produce a synthetic version of natural rubber. Isoprene, however, can be a harmful environmental pollutant and toxicant when present in excess. It can form explosive mixtures in air and is highly reactive, capable of polymerizing explosively when heated. The United States Department of Transportation considers isoprene a hazardous material that needs to be marked, labeled, and transported with appropriate care. As noted above, isoprene is produced biologically in animals, plants, and humans. Its estimated production rate in the human body is .15 µmol/kg/h, equivalent to approximately 17 mg/day for a 70 kg person. Isoprene is also common in low concentrations in many foods. Isoprene is produced in the chloroplasts of leaves of certain tree species through the DMAPP pathway; the enzyme isoprene synthase is responsible for its biosynthesis. The amount of isoprene released from isoprene-emitting vegetation depends on leaf mass, leaf area, light (particularly photosynthetic photon flux density), and leaf temperature. Thus, during the night, little isoprene is emitted from tree leaves while daytime emissions are expected to be substantial (~5-20 mg/m2/h) during hot and sunny days. With a global biogenic production in the range of 400–600 Tg of carbon/year, isoprene has a large impact on atmospheric processes and is thus an important compound in the field of Atmospheric Chemistry. Isoprene affects the oxidative state of large air masses, is an important precursor for ozone, a pollutant in the lower atmosphere. Furthermore, isoprene forms secondary organic aerosols through photooxidation with OH radicals which also have wide-ranging health effects, particularly for the respiratory tract, and reduce visibility due to light scattering effects. Because of its atmospheric importance, much work has been devoted to emission studies from isoprene-emitting vegetation, and, kinetic and mechanistic studies of isoprene oxidation via OH radicals, ozone, and NO3 radicals. It is a common structural motif in biological systems. The terpenes (for example, the carotenes are tetraterpenes) are derived from isoprene, as are the terpenoids and coenzyme Q. Also derived from isoprene are phytol, retinol (vitamin A), tocopherol (vitamin E), dolichols, and squalene. Heme A has an isoprenoid tail, and lanosterol, the sterol precursor in animals, is derived from squalene and hence from isoprene. The functional isoprene units in biological systems are dimethylallyl pyrophosphate (DMAPP) and its isomer isopentenyl pyrophosphate (IPP), which are used in the biosynthesis of terpenes and lanosterol derivatives. In virtually all organisms, isoprene derivatives are synthesized by the HMG-CoA reductase pathway. Addition of these chains to proteins is termed isoprenylation. According to the United States Department of Health and Human Services Eleventh Edition Report on Carcinogens, isoprene is reasonably expected to be a human carcinogen. Tumors have been observed in multiple locations in multiple test species exposed to isoprene vapor. No adequate human studies of the relationship between isoprene exposure and human cancer have been reported. HMG-CoA reductase inhibitors, also known as the group of cholesterol-lowering drugs called statins, inhibit the synthesis of mevalonate. Mevalonate is a precursor to isopentenyl pyrophosphate, which combines with its isomer, dimethylallyl pyrophosphate, in repeating alternations to form isoprene (or polyprenyl) chains. Statins are used to lower cholesterol, which is synthesized from the 15-carbon isoprenoid, farnesyl pyrophosphate, but also inhibit all other isoprenes, including coenzyme Q10. This flow chart shows the biosynthesis of isoprenes, and the point at which statins act to inhibit this process. Claeys, M., et al. 2004. “Formation of secondary organic aerosols through photooxidation of isoprene.” Science, 303 (5661): 1173-1176. Monson, R. K. and E. A. Holland. 2001. “Biospheric trace gas fluxes and their control over tropospheric chemistry.” Annual Review of Ecology and Systematics, 32: 547-576. Pier, P. A. and C. McDuffie. 1997. “Seasonal isoprene emission rates and model comparisons using whole-tree emissions from white oak.” Journal of Geophysical Research, 102 (D20): 23,963–23,971. Poisson, N., M. Kanakidou, and P. J. Crutzen. 2000. “Impact of nonmethanehydrocarbons on tropospheric chemistry and the oxidizing power of the global troposphere: 3-dimensional modeling results.” Journal of Atmospheric Chemistry, 36 (2): 157–230. Poschl, U., R. von Kuhlmann, N. Poisson, and P. J. Crutzen. 2000. “Development and intercomparison of condensed isoprene oxidation mechanisms for global atmospheric modeling.” Journal of Atmospheric Chemistry, 37 (1): 29–52. This page was last modified on 24 April 2014, at 16:43.